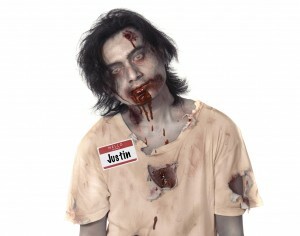 Conversing with Zombies: Tips for maximizing your trade show booth exchanges. You are talking to a Zombie, but hey, it’s not his fault. And you shouldn’t miss the opportunity to turn this Zombie into a prospect. He’s been turned into a Zombie by several factors, all of which we can help you overcome. First, he’s on sensory overload. Too many booths, too many signs, too much noise in the exhibit hall and too many over-eager salespeople are trying to get his attention. Yes, he’s at the Expo because he’s looking for solutions, but all of the proper conditions needed to make an assessment of your services – and his possible need for them – have been melded into a shrieking mass of noise and light. Tip #1: Hit the “Pause” button. My favorite “pause”-inducing giveaway is a small water bottle that can be consumed in about three swallows. Keep them in a small cooler at the edge of your booth. Open one and hand it to your prospect with a heart-felt, “You look thirsty!” Having the small opened bottle handed to them implies a sharing, and your prospect will feel that he should drink it there and not walk away. You’ve bought some time and the potential for a meaningful conversation. Second, he’s shopping by buzzword, not by the range of your company’s service package. When he asks “What do you guys do?”, he’s looking for the on/off switch to respond “Need it” or “Don’t need it”. Your company’s range of services can’t be covered in one word. Tip #2 Answer a question with an open ended answer. My favorites include “We help our clients find new customers” and “We help our clients generate more sales from their existing customer base.” Naturally, this leads to another question and a dialog begins. By answering with a solution to a problem, you avoid being turned “off” by your prospect. The company may very well need your range of services but can’t explore that possibility from a quick, closed answer. Third, Zombies want brains, right? So give them yours. All that literature in his bag and all of the literature on your table will probably hit a file cabinet (if not a wastebasket) upon his return to the office. Try these tips, and your Zombie may magically transform into your next new customer. Would you like to discuss improving the quality and quantity of visitors to your show? Click here and send us an email with your phone number and show date!